Learn how to paint abstract art in acrylics! 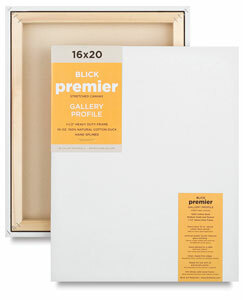 To start with, what do you want your abstract painting to look like? For instance, do you like lots of detail, or do you prefer vast washes of color? There are many different styles of abstract art, so the first step is to decide which style of abstract art you would like to paint! Then you can learn the different techniques for how to paint abstract art in those styles. 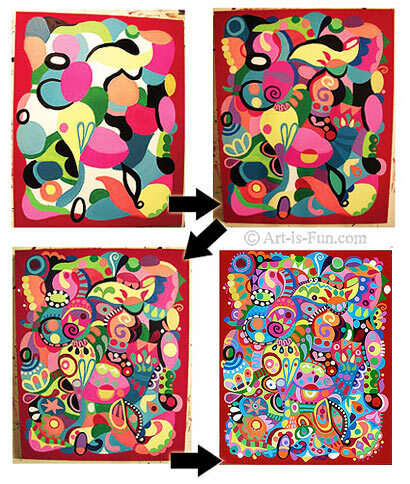 On this page I'll explain the steps I used to create the colorful, funky painting below. The creation of this painting primarily involves an additive process (also known as a layering process). 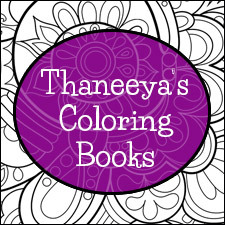 If you like color, energy and detail, this process may be very fun and beneficial for you to try out for yourself! How was this acrylic abstract painting created? 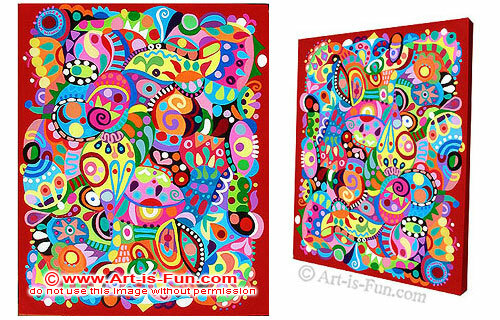 Artist's visual choices: colorful, highly detailed, and intricate, flowing patterns. Basic description of process: intuitive painting process (not pre-planned), additive/layering process, and opaque layers of color. 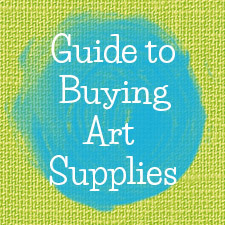 If you are new to acrylics, you can find out all about the art supplies you will need for creating paintings in acrylic in my guide to Art Supplies for Acrylic Painting. You can also read an overview of the basic characteristics of acrylics. If you make a purchase via the links below I receive a small commission (at no cost to you), which helps support this site. I painted the edges and sides of a 16" x 20" canvas with red acrylic paint. I used 2-3 layers of paint, because I wanted the red to be really strong and opaque - not allowing any of the white of the canvas to show through. I waited for each layer to dry to before adding the next layer. Acrylics dry very quickly, so this didn't take very long. 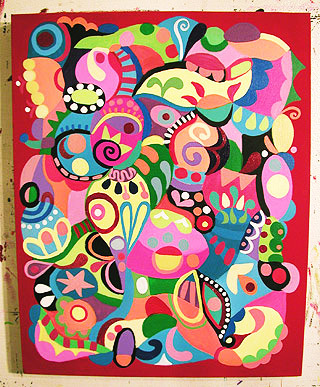 I knew what I wanted the central part of the painting to look like - I wanted to paint it in my usual funky abstract style, writhing and wriggling with bold colors, bright shapes and intricate designs! When I work in this style, I create the shapes spontaneously and decide on their placement in an entirely intuitive manner. I don't pre-plan anything. I then painted in various shapes, one color at a time. For instance, first I painted in all the yellow shapes. Then all the orange shapes, then dark pink, light pink, etc. I strive to create a balanced variety of shapes and colors. The idea is that the different shapes and placement of colors will cause the viewer's eyes to bounce around the canvas. In this way I seek to create a sense of movement and energy in these funky artworks. So I continue painting in these shapes until the white canvas is entirely covered. These shapes will form the bottom layer of the composition. This first layer of shapes are painted next to each other, as opposed to on top of each other. Now that the initial bottom layer is mostly covered, I start painting in smaller details on top of the shapes I already painting. This is called an additive process, or a layering process, because it involves adding layers to create the painting. This is one technique you can use to paint abstract art in acrylics. In general, the new details I add are confined to the space of each particular shape. Thus each shape winds up being truly unique from all the other shapes. I primarily paint circles, half-circles, dots, swirls, curls, raindrops, triangles, and lines. These designs are very influenced by tribal folk arts from around the world. The process of adding more layers of detail continues. As more details are added, they become smaller because I start placing details on top of details. As mentioned earlier, the colors are chosen to create a sense of movement. I want the colors to pop off the canvas. When I add details, I add them one color at a time. For instance, I'll add all the white details over the entire canvas, then I'll add all the red ones, and so on. This means I only have to squeeze out one color at a time. Because acrylics dry quickly, I try not to have more on my palette than I'll actually use! I continue adding colors and designs until the painting "feels" complete and balanced. Because it's an abstract painting that is created in an intuitive manner, there is no obvious "finishing point". I just have to let my gut feeling tell me when the painting is done. When working on these types of paintings, I often turn the painting on its side, or upside down, to see it from a different perspective. There is not a specific side that is supposed to be the top of the painting - I leave that up to the buyer's preference. Turning the painting upside-down or on its side while creating the artwork helps me to see which areas are balanced or unbalanced, so I know where to focus. As you can see from this painting, there are many different shapes and colors, but there is an overall feeling of balance and harmony . You can see from the images above how the process for creating this style of painting is an additive, layering process. Basically, I keep adding designs and adding colors until the painting has a sense of completeness. Wanna see what people created by following this abstract art tutorial? I put up this tutorial over 2 years ago, and since then I've received tons of emails from teachers and beginning artists, letting me know how much they (and their students) enjoyed learning to paint abstract art in this style. That rocks! Especially when teachers tell me that students who used to hate art suddenly found themselves enjoying this project! This painting lesson shows you how I make abstract paintings in my signature style. It took me many years of experimentation to develop this style of abstract painting. When you're starting out, it's helpful to be inspired by other artists and their working styles. It's okay to copy for educational purposes, as long as you credit the artist whenever you display the piece online or offline. 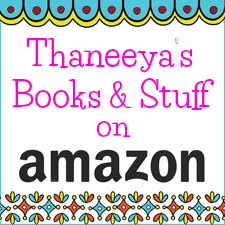 (Selling is another story, which I'll get to in a moment.) But don't copy other people's art too much - adapt the ideas that you're learning here to suit your own needs - to reflect your own personality, interests and experiences. The more you learn in your quest of how to paint abstract art, the more you will find your own style and your own artistic "voice". 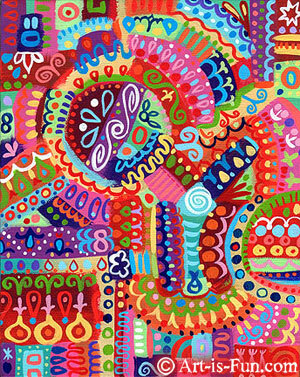 For example, as my abstract style developed, I was influenced by tribal art, Aboriginal art, modern abstract art (particularly Paul Klee, Hundertwasser and Kandinsky) as well as Persian miniatures, Indian textiles, Mexican Huichol art, Peruvian retablos, and a host of other imagery and styles that fueled my creative fire. I internalized these influences, pondered the elements that I found most attractive, and through a series of trial and error, developed my style and techniques that I'm sharing with you here. I truly enjoy sharing my techniques so that others may also enjoy the process of making art, rather than keep my processes a "trade secret" like many artists do. I figure, if making art makes me happy, I'd love for it to make you happy too! So now the question: Is it okay to sell art made from this tutorial? Please take all of this into consideration before you decide to sell any art you create from this tutorial. If you do decide to go ahead and publicly display or sell your paintings that you made based on this lesson, please give proper credit, such as "Title of artwork, based on a tutorial by Thaneeya McArdle" or "Title of artwork, inspired by the work of Thaneeya McArdle". I thank you in advance! 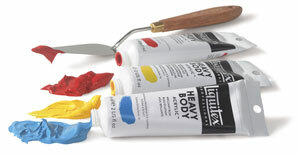 Remember: This page demonstrates just one method of how to paint abstract art in acrylics. There are also many other ways to go about making abstract art. Use these ideas as a starting point to create your own style. It's a fun process! Just lift your wings and fly! 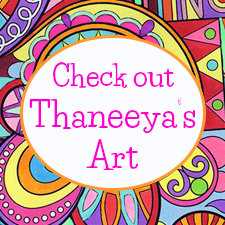 You can see more of my abstract paintings on my website, www.thaneeya.com.